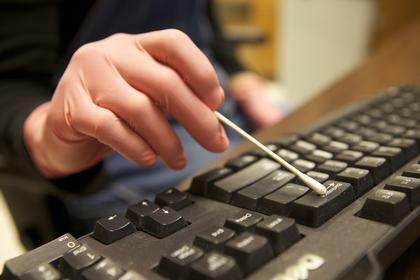 Forensic scientists may soon have a valuable new item in their toolkits -- a way to identify individuals using unique, telltale types of hand bacteria left behind on objects like keyboards and computer mice, says a new University of Colorado at Boulder study.The CU-Boulder study showed that "personal" bacterial communities living on the fingers and palms of individual computer users that were deposited on keyboards and mice matched the bacterial DNA signatures of users much more closely than those of random people. While the development of the technique is continuing, it could provide a way for forensics experts to independently confirm the accuracy of DNA and fingerprint analyses, says CU-Boulder Assistant Professor Noah Fierer, chief author on the study. "Each one of us leaves a unique trail of bugs behind as we travel through our daily lives," said Fierer, an assistant professor in CU-Boulder's ecology and evolutionary biology department. "While this project is still in it's preliminary stages, we think the technique could eventually become a valuable new item in the toolbox of forensic scientists."